A colleague asked me why he sees Application_Start events after modifying his Web.config but does not get a new process id for the worker process. While this article is addressed to IIS 5 and 6, I think the same principle must apply for IIS 7. From what I can tell, a change to the Web.config will result in tear down of the Application Domain, but not the Application Manager. The Application Manager is what controls the worker process. If anyone disagrees with this, let me know. We use .NET’s System.DirectoryServices namespace to surf Active Directory (AD). We use the machine’s parent to grab Properties. When trying to get Properties from the parent (DirectoryEntry.Parent.Properties) we continually got the message “The Network Path Was Not Found.” After some in-depth troubleshooting, we found that we had to add companyqa.mycompany.com to the DNS suffix list. The only values were company.mycompany.com and so we couldn’t find the LDAP.companyqa.mycompany.com AD server. In Windows 2008 Server, this setting is under Control Panel - Network Connections - Local Area Connections – Internet Protocol Version 4 (TCP/IPv4) - Properties – DNS – Append These DNS Suffixes. After we added companyqa.mycompany.com we were on our way. Grant Holiday (a blog I highly recommend) posted DevDiv’s 2010 hardware topology. Oddly enough, our proposed solution looks much the same. With TFS 2008, we’re currently making use of F5’s Big/Ip for controlling access to our primary and standby server. 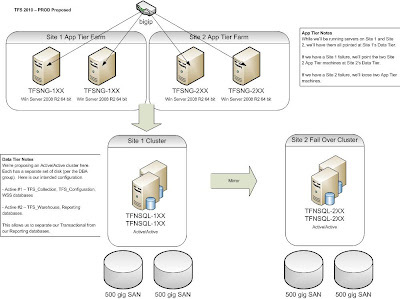 We switch between the two during failover situations. With 2010 we’ll be enabling Round Robin and opening up load balancing between 4 VMs running the TFS 2010 App Tier on 2008 Server R2. Moreover, like DevDiv, we’re taking the opportunity to break out our Warehouse and Analysis Services to a separate server. Our plan is to run an Active/Active cluster. Active Node 1 will run things like TFS_Configuration while Active Node 2 will run the Tfs_Warehouse and Reporting Services databases. If we have hardware failure, we’ll have a single Node running both while the failed node is repaired. We were thinking of doing a 3-node Active/Active/Passive cluster, but the data center didn’t feel comfortable with that because they don’t currently support that configuration. Let me know what you think of our solution.